Even as economic losses and unemployment levels mount, America’s most effective engine for wealth and job creation is being dangerously — perhaps fatally — compromised. 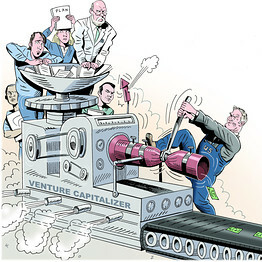 For more than 30 years the entrepreneurship-venture capital-IPO cycle centered in Silicon Valley has generated new wealth, commercialized innovation, and created new companies and industries. It’s also spun off millions of new jobs. The great companies created by this process — Intel, Apple, Google, eBay, Microsoft, Cisco, to name just a few — have propelled most of the growth in the U.S. economy in the last two decades. And what began as a process almost exclusively available to scientists and engineering Ph.D.s became open to just about anyone with a good business plan and a healthy dose of entrepreneurial drive. At its best, the cycle is self-perpetuating. Entrepreneurs come up with a new idea, form a team, write a business plan, and then pitch their idea to venture capitalists. If they’re persuaded, the VCs invest, typically through several rounds during which the start-up company must meet performance benchmarks. Should the company succeed, it then makes an initial public offering of stock. The IPO can reward the founders and venture-capital investors, and enables the general public to participate in the company’s success. Thousands of secretaries, clerks and technicians at these companies also have come away from the IPO richer than they ever dreamed. Meanwhile, some of those gains are invested in new venture funds, and the cycle begins again. It has been a system of amazing efficiency, its biggest past weakness being that it sometimes (as in the dot-com “bubble”) creates too many companies of dubious viability. Now, this very efficiency may be proving to be its downfall. Faced with crushing reporting costs if they go public, new companies are instead selling themselves to big, existing corporations. For the last four years it has seemed that every new business plan in Silicon Valley has ended with the statement “And then we sell to Google.” The venture capital industry is now underwater, paying out less than it is taking in. Small potential shareholders are denied access to future gains. Power is being ever more centralized in big, established companies. For all of this, we can first thank Sarbanes-Oxley. Cooked up in the wake of accounting scandals earlier this decade, it has essentially killed the creation of new public companies in America, hamstrung the NYSE and Nasdaq (while making the London Stock Exchange rich), and cost U.S. industry more than $200 billion by some estimates. Meanwhile, FASB has fiddled with the accounting rules so much that, as one of America’s most dynamic business executives, T.J. Rodgers of Cypress Semiconductor, recently blogged: “My financial statements are a mystery, even to me.” FASB’s “mark-to-market” accounting rules helped drive AIG and Bear Stearns into bankruptcy, even though they were cash-positive. But FASB’s biggest crime against the economy and the American people came when it decided to measure the impossible: options expensing. Given that most stock options in new start-up companies are never worth anything, this would seem a fool’s errand. But FASB went ahead — thereby drying up options as an incentive for people to take the risk of joining a young company and guaranteeing that the legendary millionaire secretaries would never be seen again.